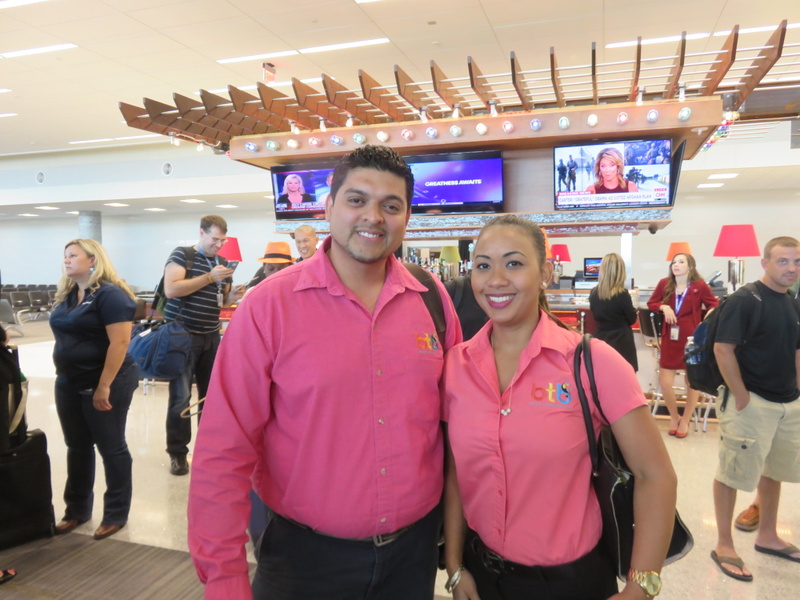 Home » Belize Travel Blog » Travel » Houston, You Have An Option! 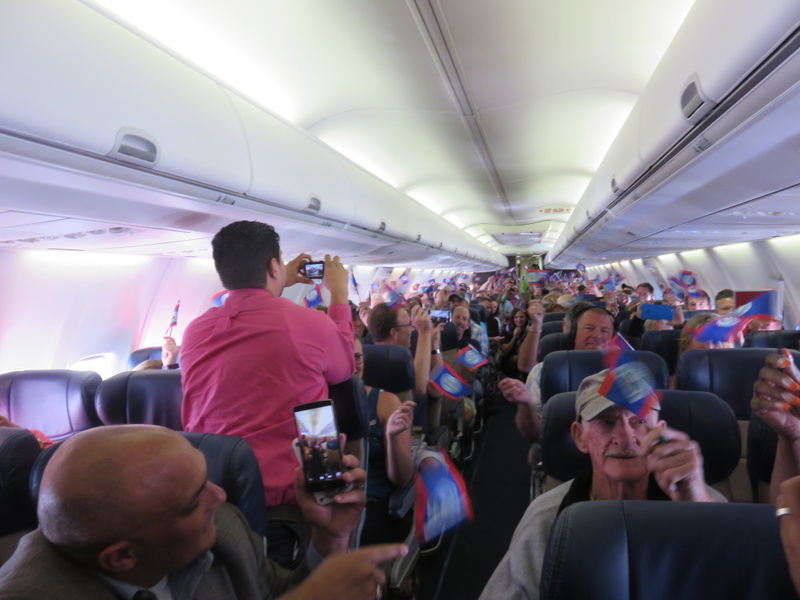 Daily SOUTHWEST Airlines Flights Begin From Hobby Airport to Belize! Houston, You Have An Option! 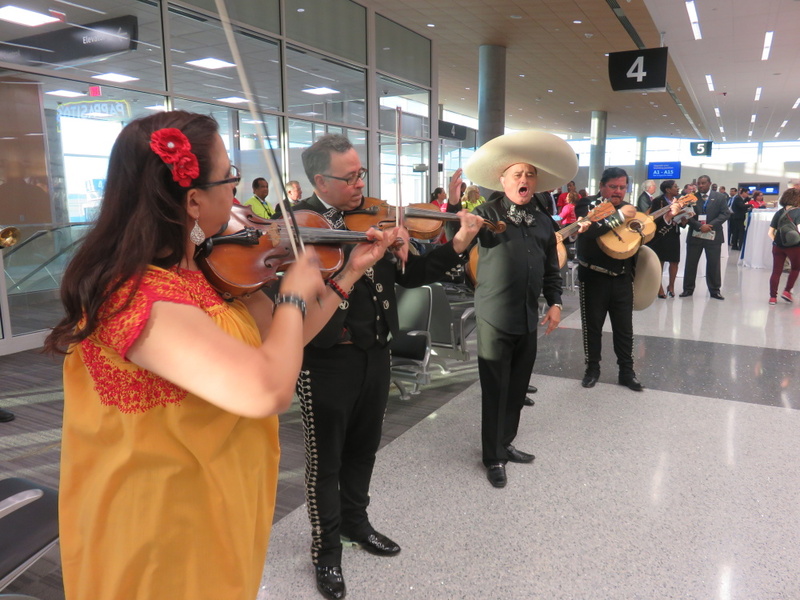 Daily SOUTHWEST Airlines Flights Begin From Hobby Airport to Belize! 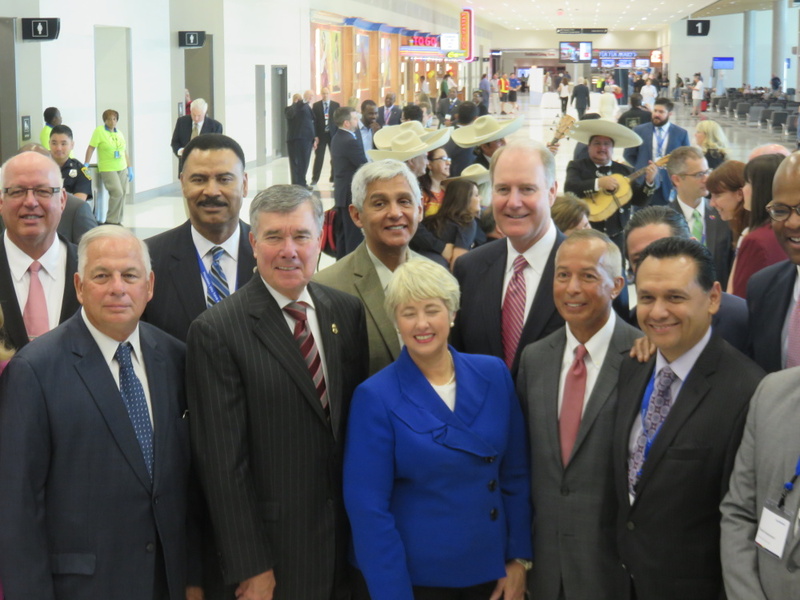 Southwest Airlines and the city of Houston have been working for years to open up the city’s smaller airport (as compared to Bush International Airport) to International flights. And yesterday was the day. AND WHAT A DAY IT WAS. Here’s the low down. Greeted at the check-in desk with coffee, donuts and smiles. 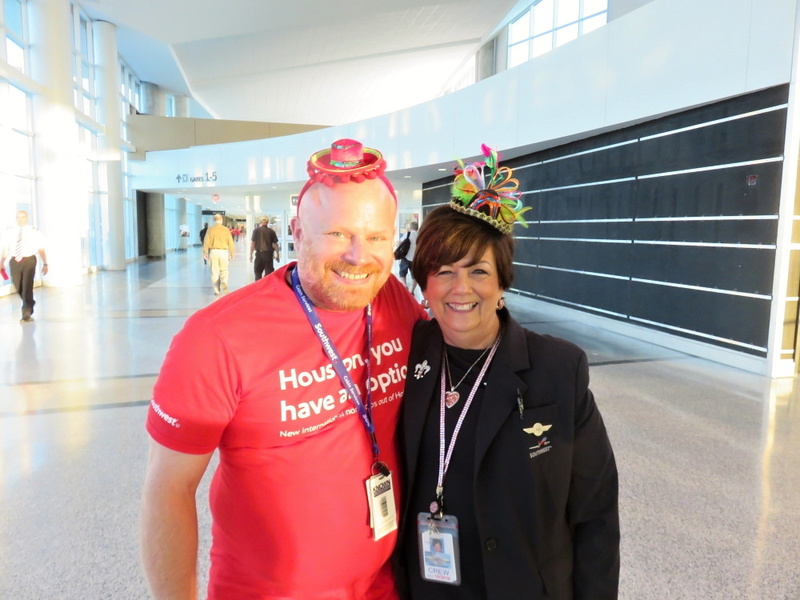 Once thru security – our next set of greeters…LOVE the mini-sombrero. I asked. She had bought these at Party City herself – how super cute…going that extra step for the celebration. 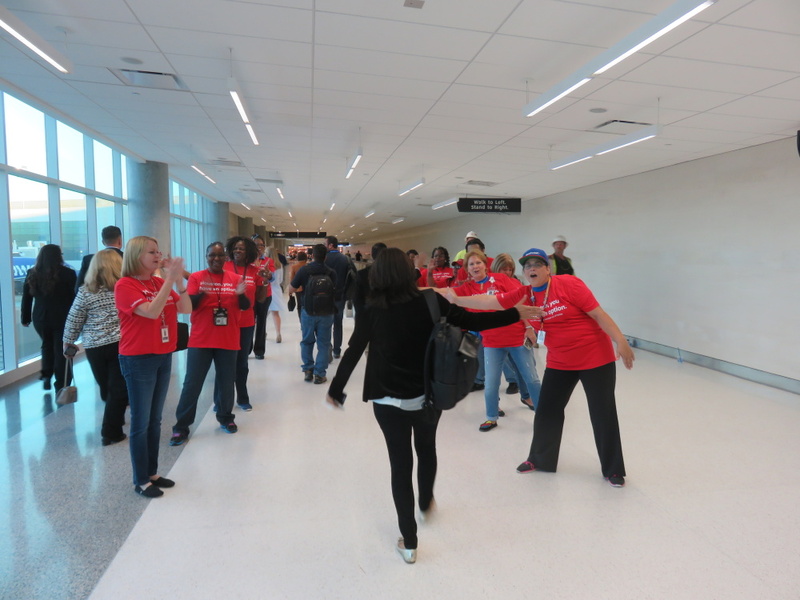 Next two lines of cheering, high fiving employees…I ran down high fiving and I know Channel 5 New Belize took a video. Oh wait…here is a picture. Here goes Marleni, the anchor from Channel 5. 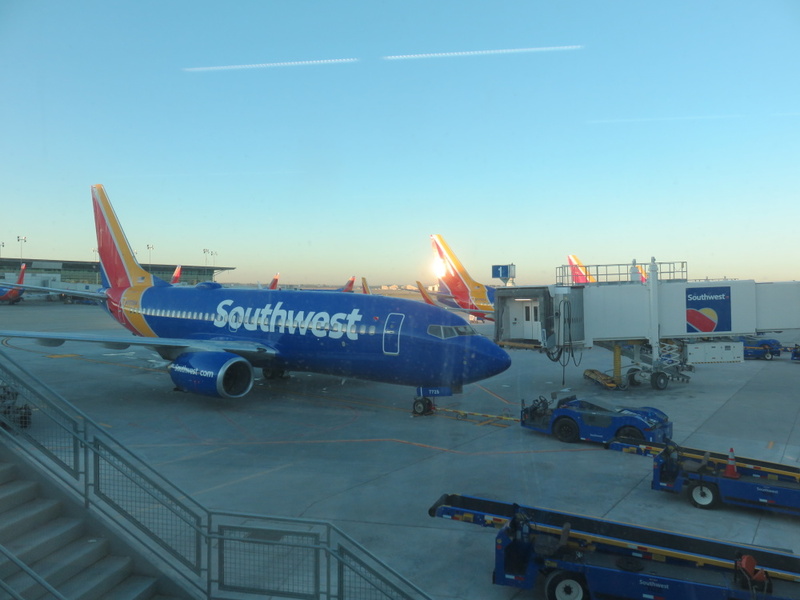 Once we arrived in the new $156 million, 5 gate, Southwest International terminal, it was madness. 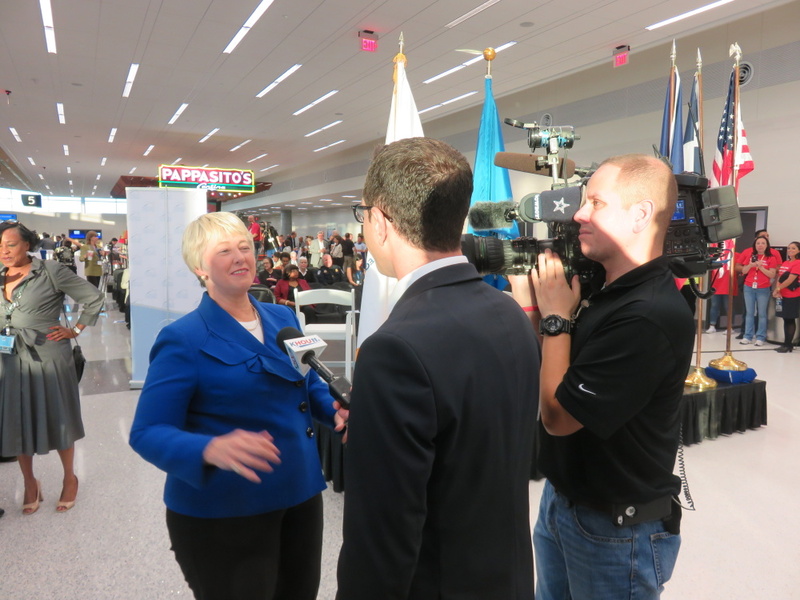 The local media…here interviewing the Mayor of Houston (a city of over 2 million people), Annise Parker. 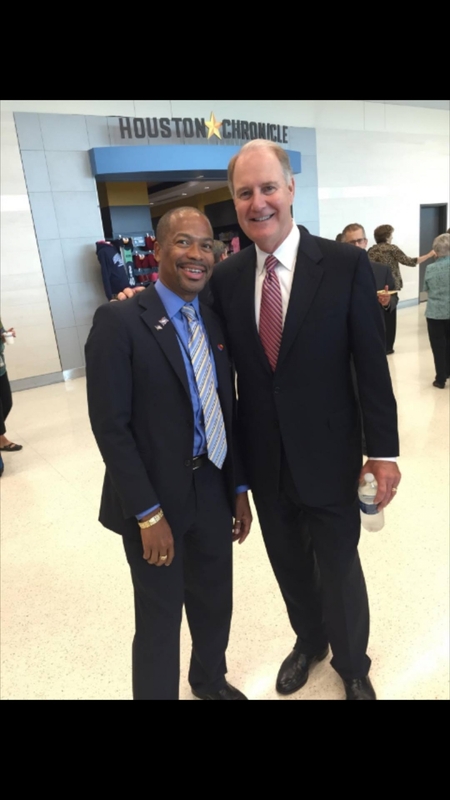 The CEO Of Southwest Airlines, local government officials…the news conference was quick and sweet. 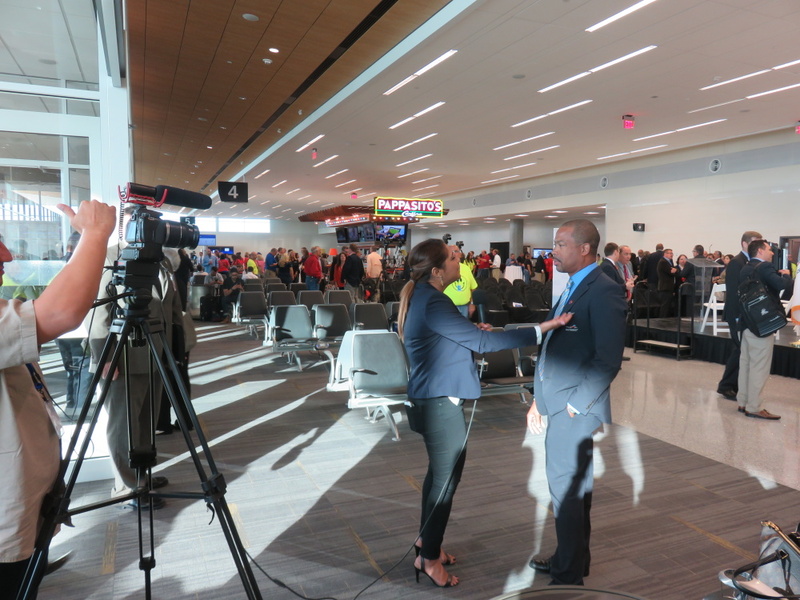 1 in 4 Houstonians is foreign born…this smaller, easier airport and Southwest as a low-fare carrier going international, can help connect local residents with friends and family abroad and vice versa. It’s been a long time in the making…hence the announcement that HOBBY HAS FINALLY BEEN FREED! 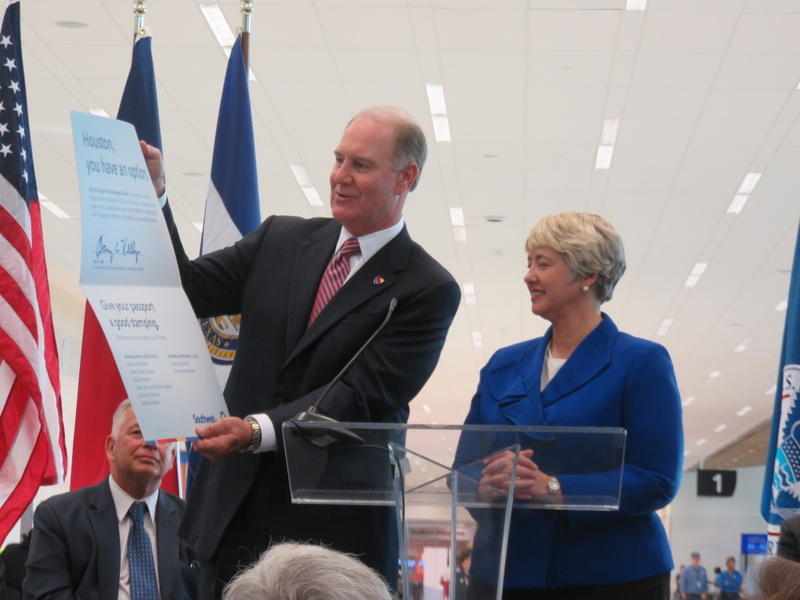 Gary Kelly, the CEO of Southwest presented the Mayor with an oversized passport. And told Houston to give their passports a good stamping. I then ran into my friend Deion Spain who grew up in Georgeville, Cayo and San Pedro (you might know some of his family DJ Debbie and Mel Spain). He was hanging out with the company CEO. 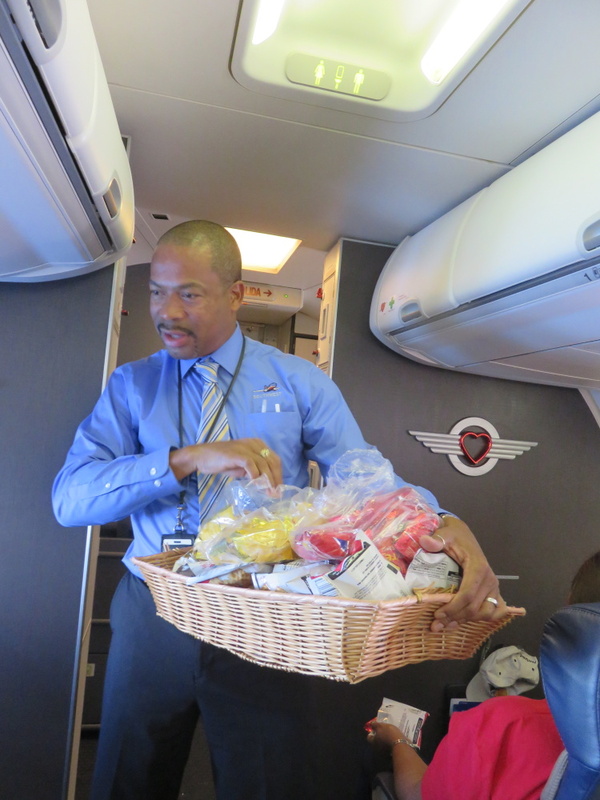 He has been a flight attendant with Southwest for over 10 years – and was a guest (and the entertainment) on the flight to Belize. Channel 5 News got their hands on him for a quick interview for yesterday’s morning show. 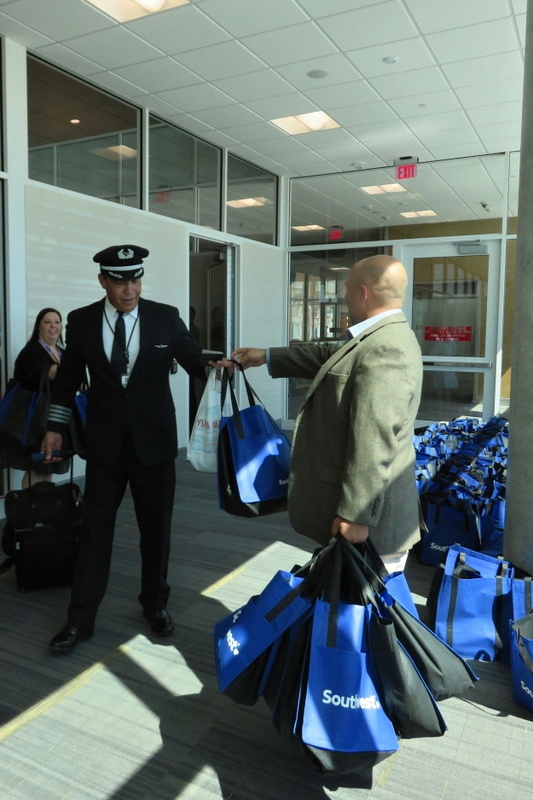 And as we boarded, we were all given Southwest gift bags. Here is Captain Lindley (in yesterday’s post) receiving his. 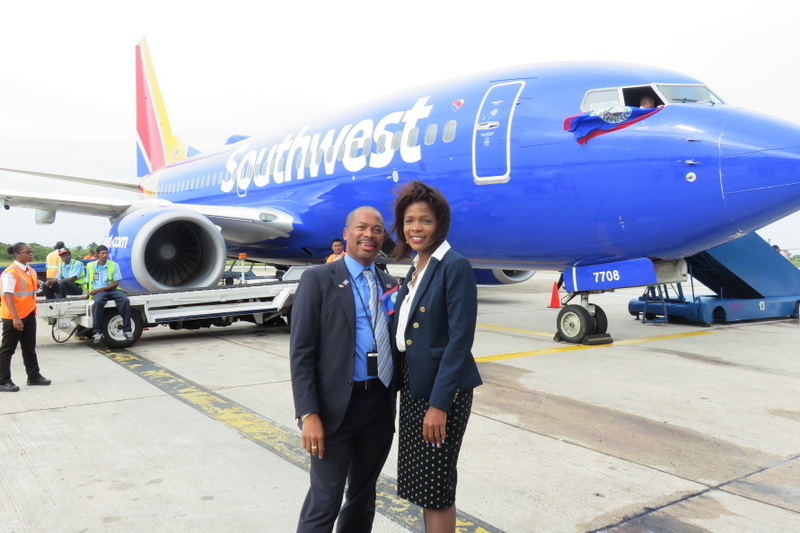 Another Belizean-Southwest employee taking the inaugural flight. And off we went. 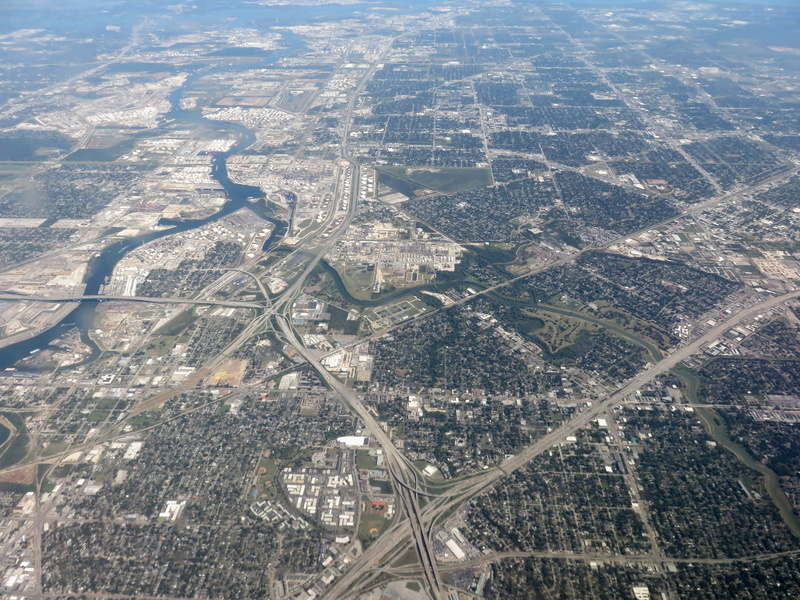 The Houston landscape…that is one BIG city. 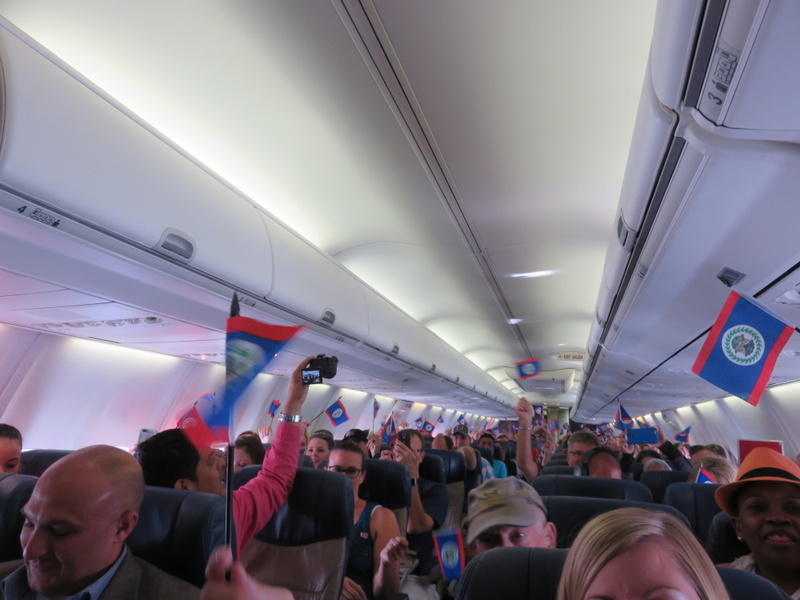 Time to get those flags waving…the BTB was about to give away some free hotel stays. 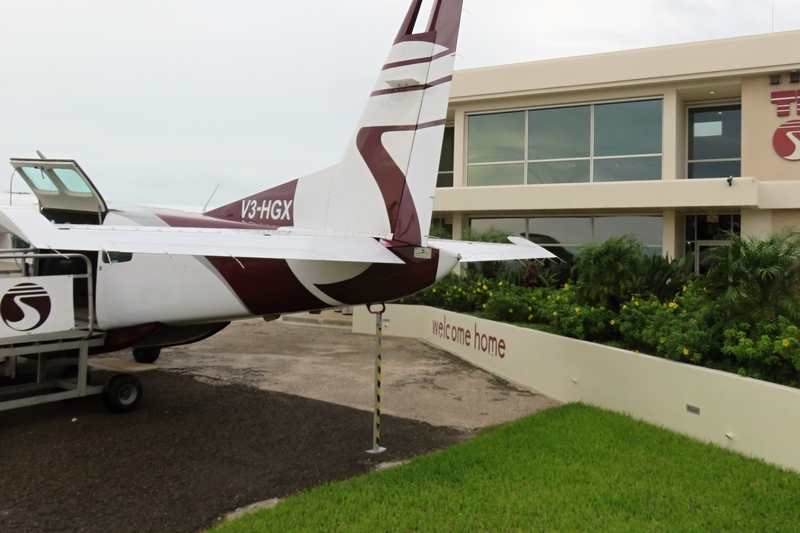 Two people looked in their Southwest magazines and found one 3 day stay at GORGEOUS Victoria House on Ambergris Caye and another 3 days at Las Terrazas. Lucky ducks! 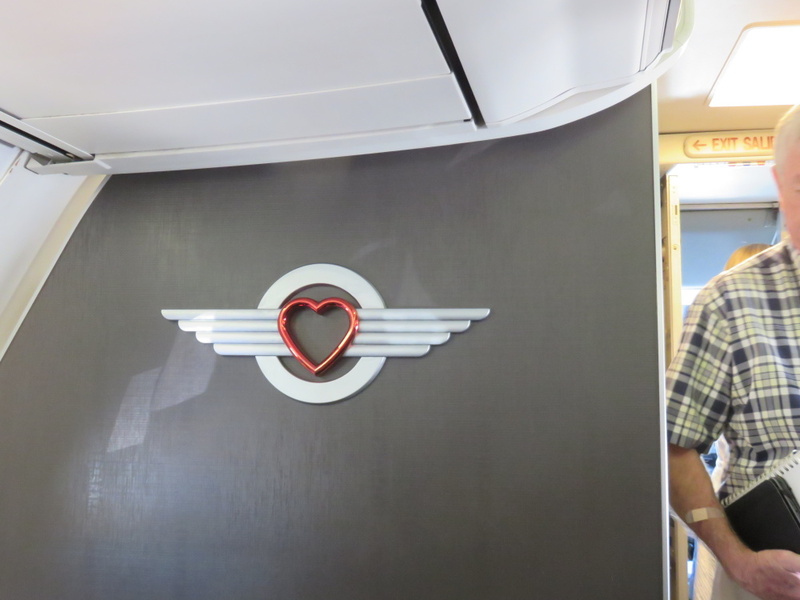 And then trivia time…questions about Southwest Airlines. 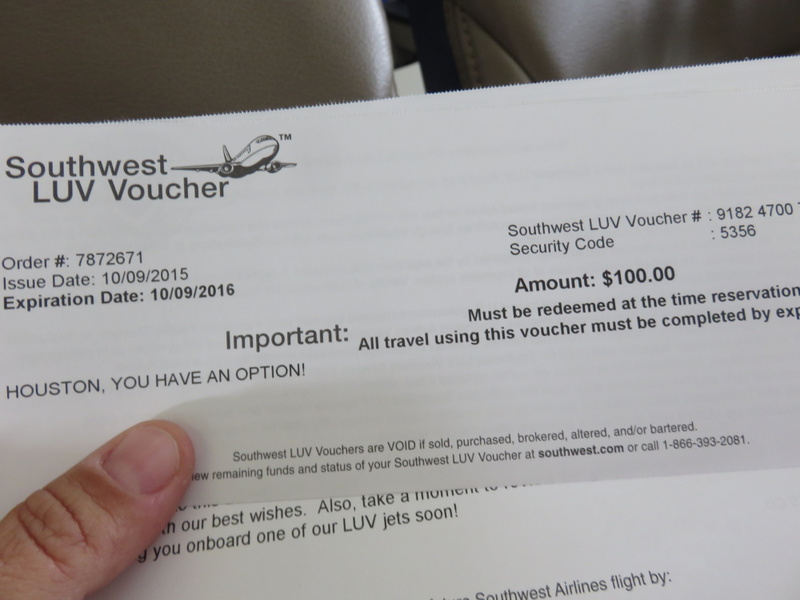 I don’t want to brag but…I won a voucher! And then Deion pulled out ALL the stops. 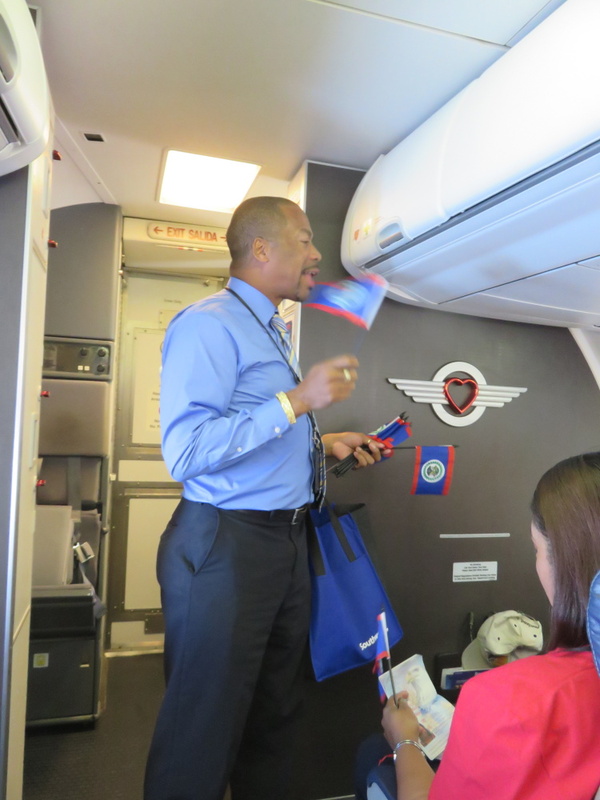 He ordered us that no photos or videos could be taken during his SINGING OF BELIZE’S NATIONAL ANTHEM. All of it – and it is not easy to sing. The flag were waving the whole time. O THE LAND OF THE FREE BY THE CARIB SEA! 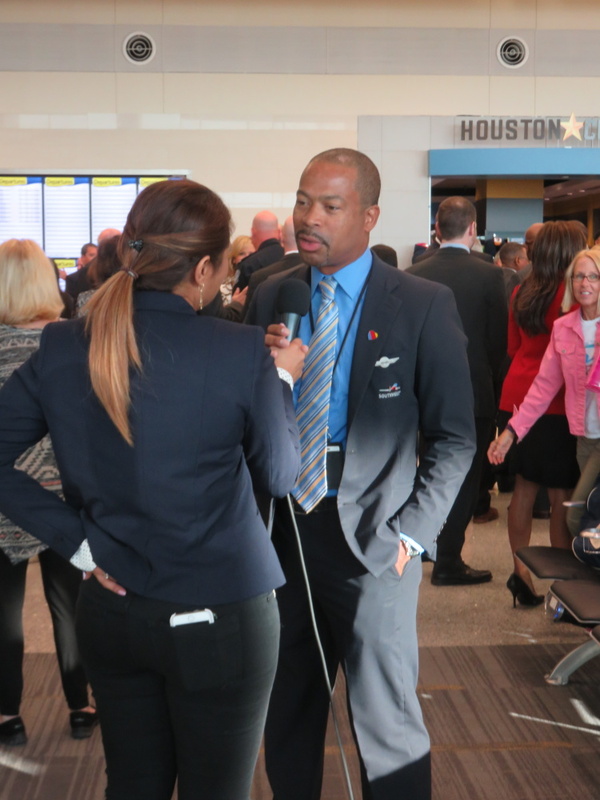 The 2 hour flight flew by and we were deboarding to a line of ministers and representatives from the BTB…and lots of photo opps. Lovely Alyssa our Southwest point person…who kept us on schedule and was unbelievably gracious the entire time. She’ll be spending her Christmas vacation on Ambergris Caye. 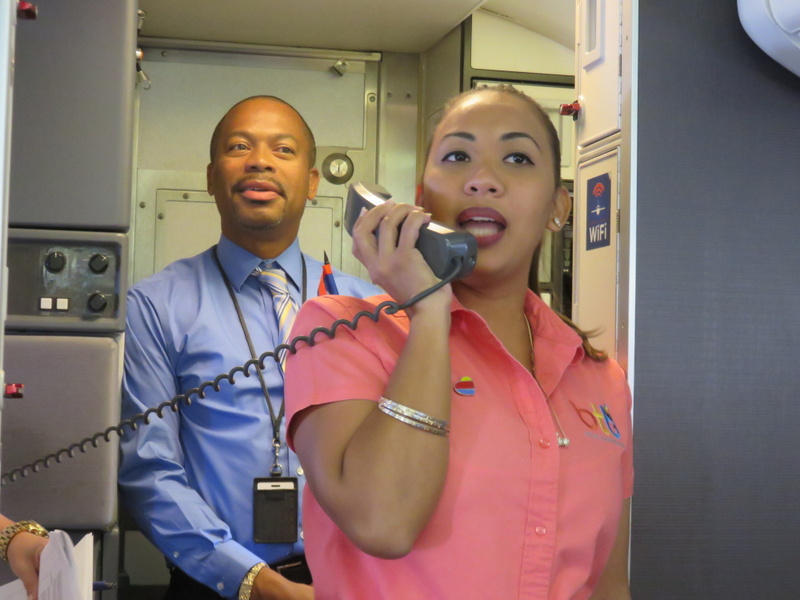 The three Southwest Belizean-American employees who helped with the entertainment and announcements on board. 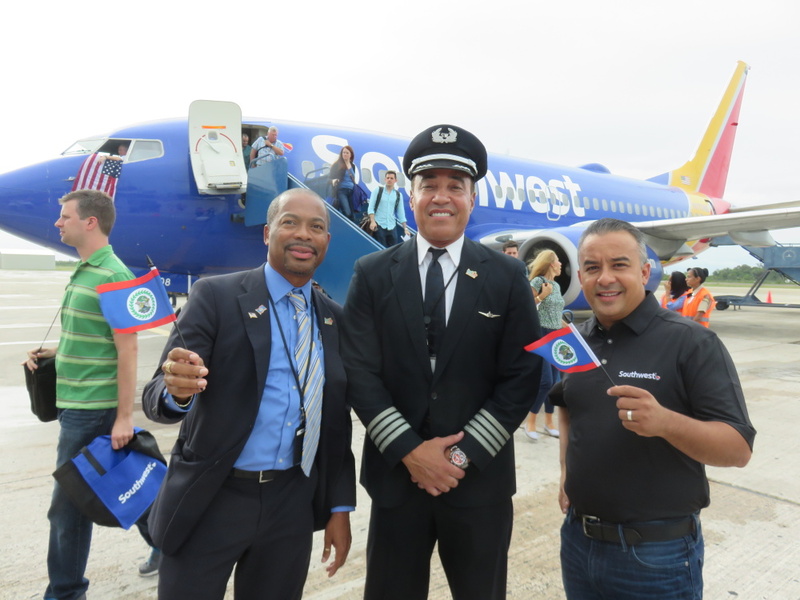 Deion Spain, Captain Lindley Reyes and Jason Martinez, a team leader whose parents were born in Belize. And then Deion and Ms Karen Bevans, Director of Tourism at the Belize Tourism Board. 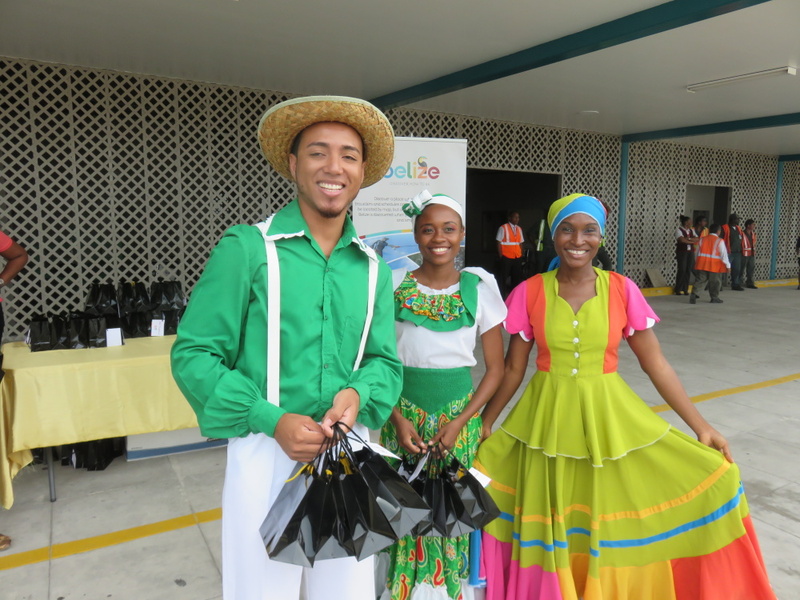 We all received Belize gift bags from this beautiful crew. 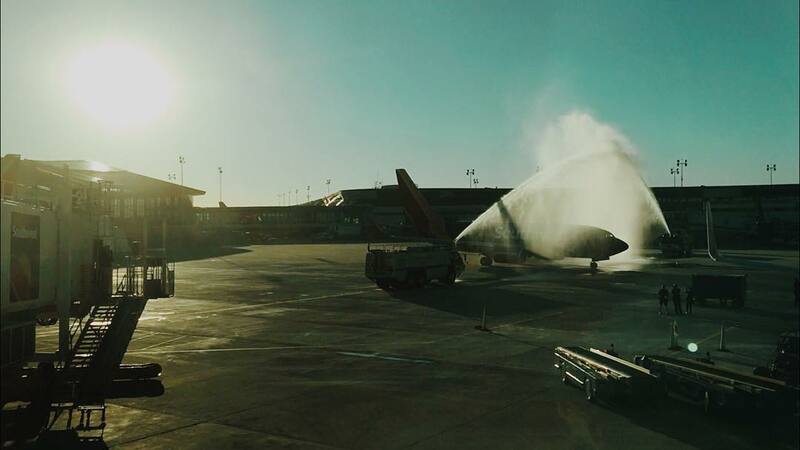 And cold Belikins awaited as our baggage was quickly unloaded. I had to check out Belikin’s pretty cool keg machine. Just a Yeti cooler, ice, lots of tubing and the keg…no need to plug it in. 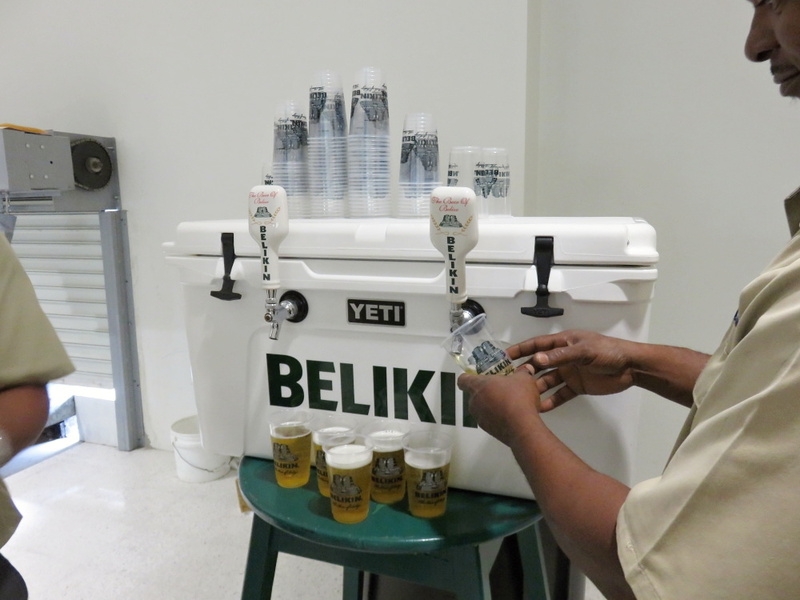 Now you can bring a keg of Belize’s national beer just about anywhere. WHAT A DAY! 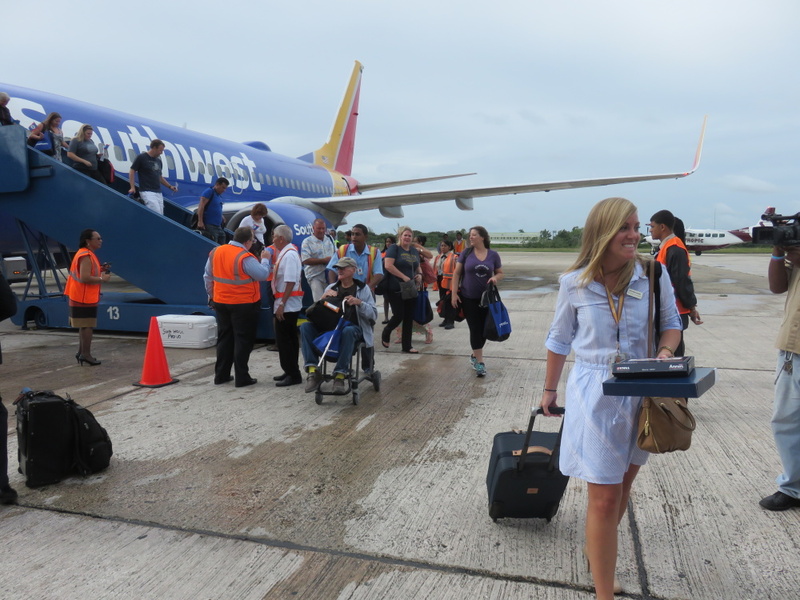 The happy passengers and I went off in all different directions – many of the Southwest employees were staying in Belize City for the night, some passengers were off on mainland adventures and lots were connecting with Tropic Air for the cayes. I was with them…and after a long day, I love to see this sign at the San Pedro air strip. Oh…and you might ask? 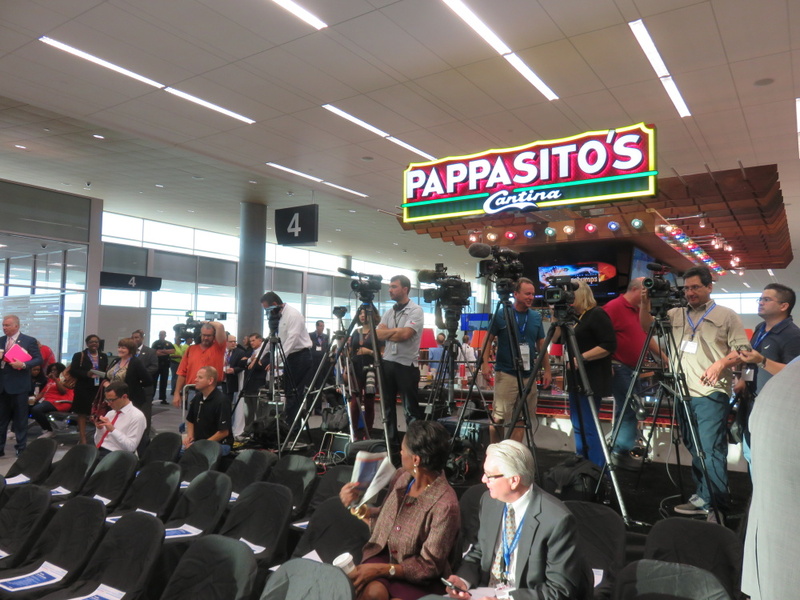 What does one bring back from Houston…on a two night trip to one of the shopping meccas of the world? MAGAZINES!!!! Mint oreos, some hair care stuff, a dog toy and biscuits, some soaps and lots of swag from Southwest (like my new travel wallet and towel) and from the BTB. Looks like a blast. A trip like that and *I* might even enjoy flying. Congrats!